The British Insurance Brokers’ Association (BIBA) has emphasised that though businesses, individuals and sectors are facing risks, these risks can be transferred via insurance enabling people and corporations to seize opportunities in these uncertain times. 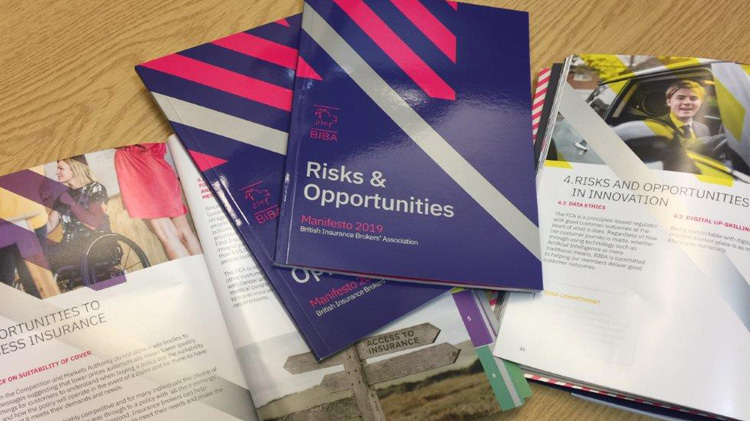 This is the theme of the 2019 BIBA Manifesto – Risks & Opportunities. It was launched in the Houses of Parliament to an audience of Ministers, MPs, Lords, senior Government officials, insurance professionals and the media on 15 January 2019. The changing landscape seen by BIBA members and their customers means that BIBA’s agenda – its Manifesto – must be reinvented every year. Along with some enduring themes, new issues impacting the insurance broking sector also need addressing. This year more than others, BIBA has identified a need to relevel the broker landscape. With a focus on the potential opportunities for the insurance broking sector and the businesses they serve the 2019 Manifesto, Risks & Opportunities has a whole section on innovation and the opportunities that will come from InsurTech. BIBA is committing to help its members digitally upskill and will also in 2019 be creating a ‘dating-service’ to put members in contact with the technology providers that can help them maximise the opportunities arising from the digital revolution as well as the changing risks faced by their clients. Of course, in creating the 2019 Manifesto one topic could not be ignored; Brexit. The matter of the UK leaving the EU continues to create immense uncertainty for insurance brokers and their customers and seven Calls to Action, ranging from trading solutions to motor insurance have been made.